Condor Flats is the smallest themed land in Disney California Adventure, even smaller than A Bug's Land, and with only one attraction and a not-so-glamorous-looking aerospace theme, it's a challenge for me to uncover a lot of good angles for photos. However, last weekend, when I was strolling through the park right before sunset, I came upon the sun just as it was setting behind the roof line of the Grand Californian Hotel. 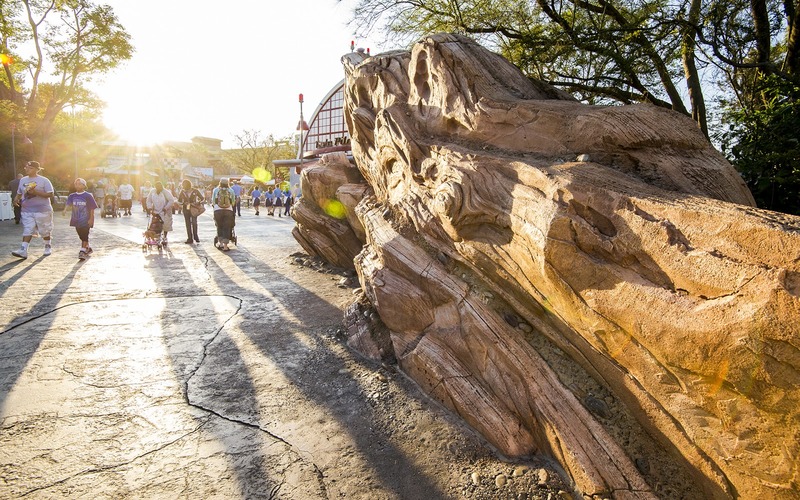 The golden sunlight streaming almost horizontally into my eyes, coupled with the barren rockwork marking the entrance, made for a dynamic scene. So I shuffled around, looking for the right angle, and with the help of the wonderfully wide end of my Nikkor 16-35mm lens, came up with something that imparts a sense of ruggedness and warmth at the same time.